Located in Soho, SoHo Cigar Bar prides itself on being one of the very few places in New York where you can find cigars, food and drink indoors. Their “1920s art deco speakeasy” feel, as owner Lee Ringelheim described it, probably makes this unlike any place you’ve ever lit up. Aside from well-known brands like Padrón, La Gloria Cubana and Macanudo, SoHo Cigar Bar has an array of its own private label cigars in the works, which will include a variety of traditional blends as well as some flavored offerings. Their classic cocktails include a SoHo Cigar Bar Cocktail (which is made with Glenmorangie, Tullamore Dew, orzata, lemon juice and an orange twist), Manhattans, old fashioneds, champagne cocktails, and a full menu of bourbons, ryes, champagne and wines. Another unique thing about SoHo Cigar Bar that feels ripped out of another era: the staff. 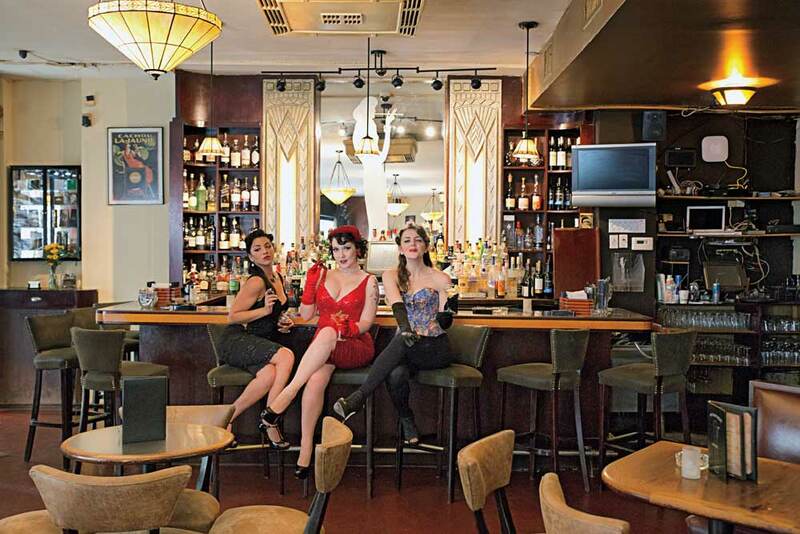 Aside from being really cool chicks, the waitresses and bartenders on hand when we stopped by were a ton of fun to hang out with (and easy on the eyes in their cabaret-style getups). “We’ve been called ‘the last bar.’ We’re not trying to be pretentious. We are a speakeasy by way of classic cocktails,” said Ringelheim. “You can see at all our locations, if you go to any of our locations, you’ll see all these monkey wallpapers, chandeliers, lamps,” said manager RJ, adding with a chuckle that he doesn’t know exactly what the deal with the monkeys is.